Hoping to raise funds for her Nepalese family affected by the April 2015 Nepal earthquake, Belinda Dupont was inspired to tell a tale she first heard in Bodh Gaya, India, many years ago about the buffalo. 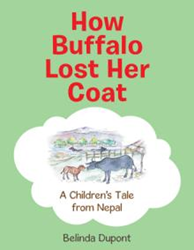 Her new children’s book, “How Buffalo Lost Her Coat: A Children’s Tale from Nepal” (published by AuthorHouse UK), shares this fable. The book is available for purchase at: https://www.authorhouse.co.uk/Bookstore/BookDetail.aspx?BookId=SKU-001191848. In the book, the children of Nepal want to know: Why is a buffalo calf born with a beautiful, long, hairy coat only to lose it as it matures to reveal a naked, leathery skin? An adult tells them the story about how Tibetan traders persuaded the bully Yak to borrow Buffalo’s coat so he could keep warm as he carried the Tibetan people’s goods home over the Himalayas. Once home, Yak refused to leave Tibet and climb back over the mountains. Buffalo’s coat was never returned. Belinda Dupont is a peripatetic country lover, traveler and storyteller. She currently lives in Bristol, but stays mostly on the move.